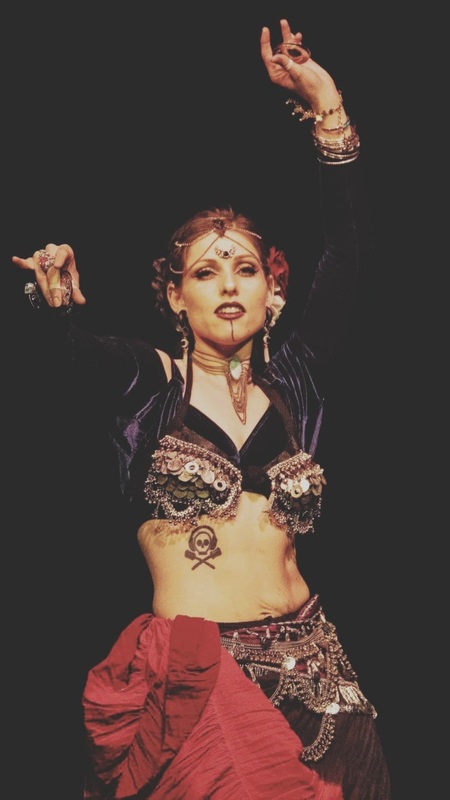 Alice has been studying ATS® since 2002 and began performing with Dark Side Tribal in 2007. She began dancing in college in the late 80s where she choreographed and performed in the contemporary dance company. Since 2010, she has been studying Hip Hop dance styles. She is currently in "40vers", a Hip Hop dance group for dancers who are 40 and older, and she is the advisor and a member of the Breakdance Club at IU. Alice has been an Academic Advisor at Indiana University since 2004 and before that she taught chemistry. She has lived in Bloomington since 1993, but grew up in the Chicago-area. Maria began dancing in 2009. She danced with ITS troupes for three years before switching to the ATS® format. 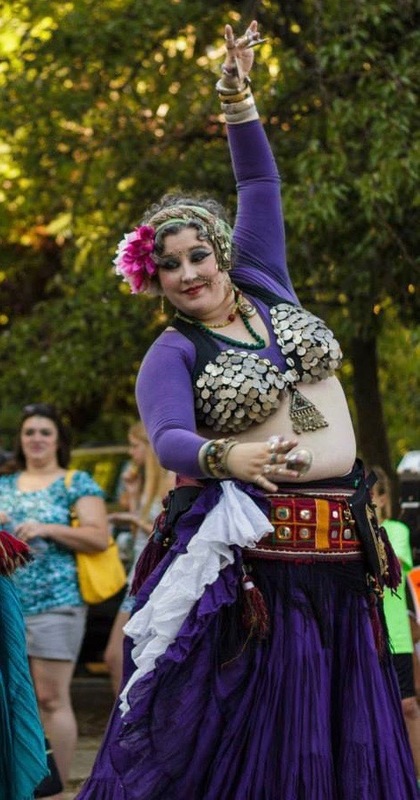 Since then, she has attended many workshops taught by members of Fat Chance Belly Dance®, and has continued to dance and perform with three Indiana-based ATS® troupes. When she's not dancing, she enjoys reading, gardening, and hula hooping. Virginia is originally from Spain, but she moved to the U.S. in 2001, finally settling down in Indiana. Her belly dance journey began in Ohio in 2005 with Sacred Shimmy and continued in Indiana with Dark Side Tribal. 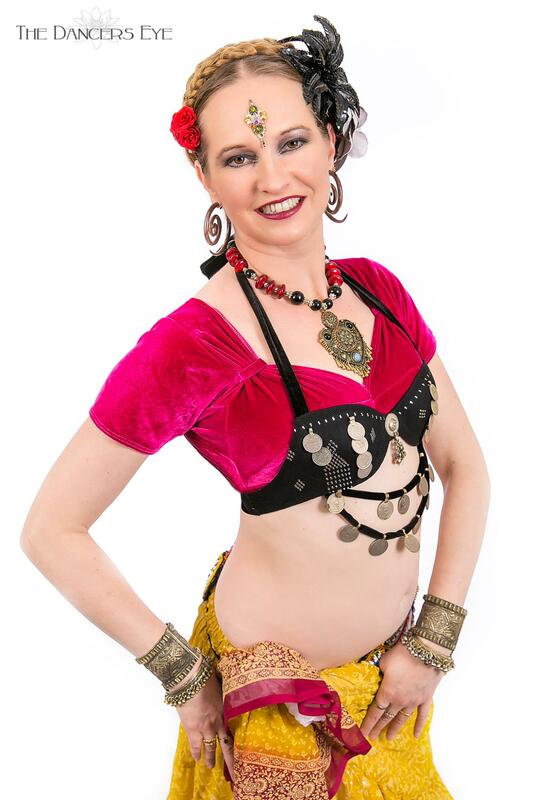 Virginia has trained extensively with Fat Chance Belly Dance®, having completed General Skills twice, Teacher Training, and Advanced Teacher Training. 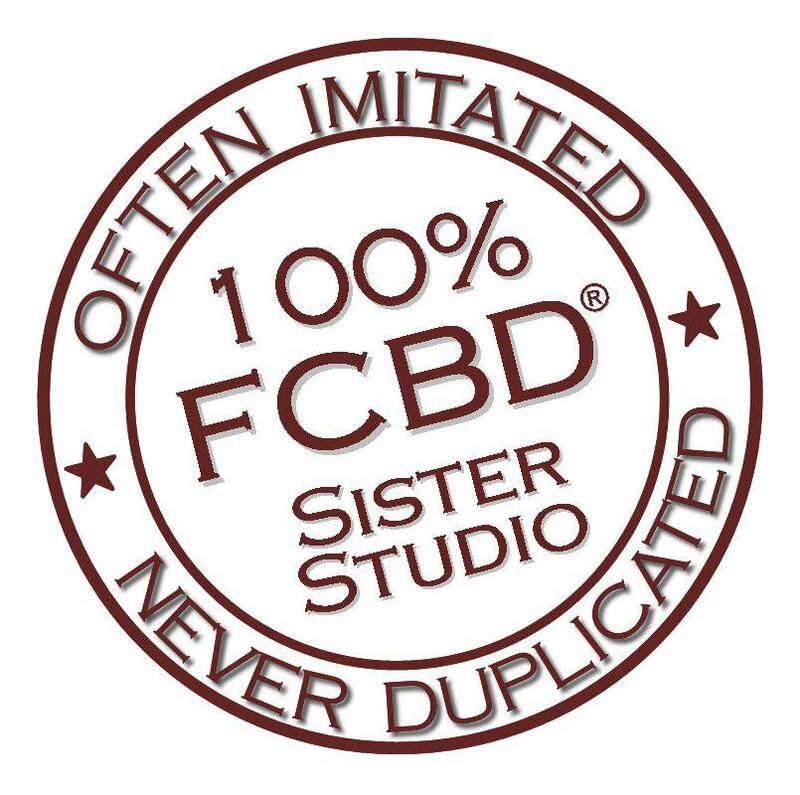 Virginia is certified to offer Sister Studio Continuing Education Credits (SSCE) to other FCBD® sister studios. and began studying with them in 2010 as well. Since then, they have become sisters as well as troupe-mates. Regen currently holds GS certification with the FCBD® studio and hopes to pursue more certifications in the future. Heather has been dancing since 1996 and her journey has taken her from folkloric bellydance to cabaret and finally to ATS®. Drawing on an almost 30 year stage experience, she co-founded Dark Side Tribal in 2006, and has been working exclusively in this style since that time. She completed the General Skills Certificate in 2012 and offers Beginning ATS® through Windfall Dance Studio. Heather feels that the sisterhood and co-creation of ATS best expresses the joy she feels in dance. At her best, she feels that the dancers are the physical embodiment of the music they hear and a conduit to connect the music, the audience and the dancers. Dark Side Tribal is an American Tribal Style® bellydance troupe and FatChanceBellyDance® Sister Studio based in Bloomington, IN. 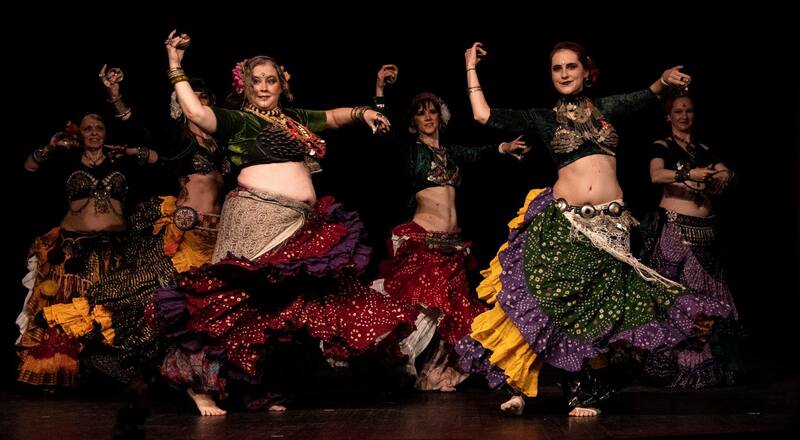 We formed in early 2006 with the goal of exploring and promoting the strength, power, and grace of tribal style bellydance, as well as celebrating the community-building aspects of improvisational group dance. Bloomington Street Fair, Sunday, April 28th, at 2:45pm outside the Monroe County Public Library on Kirkwood/Grant St.
Sarah is a fairy creature who entered this realm when she was swapped as an infant for a human child. 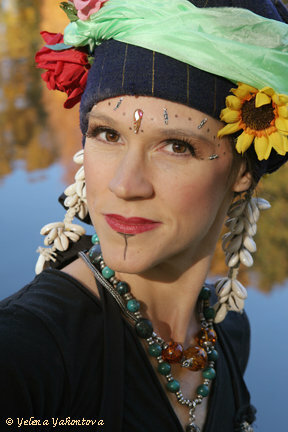 She began dancing in 2011, and honors Dark Side Tribal co-founder Heather as her first teacher. 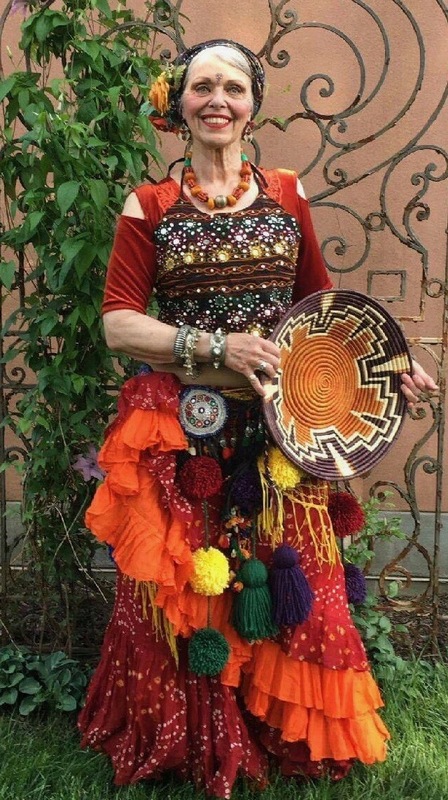 She has experimented with studies in Egyptian bellydance, Datura style improvisation, and tribal fusion, but the wild surprises and joys of ATS® remain first in her heart. She should not be left unsupervised with glitter or other shiny objects. Jenny’s ATS® journey began in 2013 when she took lessons briefly with the lovely Sarah of Dark Side. She then resumed lessons with Virginia in late 2016, and joined Dark Side Tribal in 2018. As a supporter and encourager of fellow women, one of Jenny’s favorite things about ATS® is the dominance of females in the community, but even more so the fact that so long as a body is able, a body of any gender, shape, size, ethnicity, or age can take the stage and connect with an audience through graceful yet powerful movements. Molly began dancing with Dark Side Tribal in 2017. She studied music theory and classical guitar from 2009-2014, during which time she became interested in styles of dance commonly played on classical guitar, such as flamenco and tango. 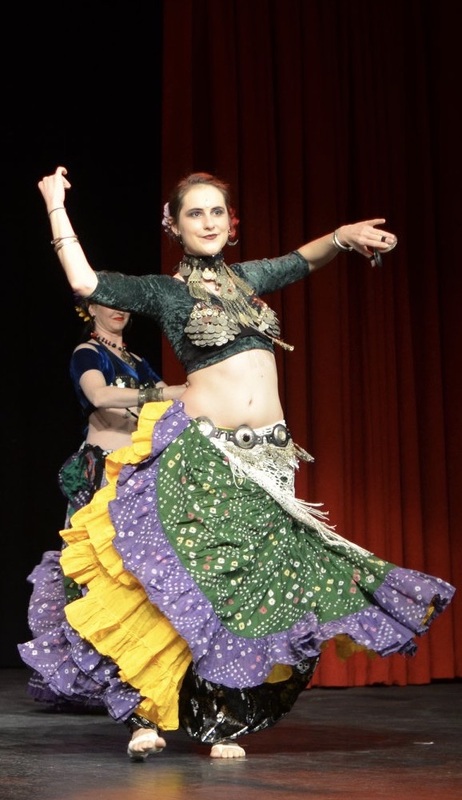 She became interested in ATS® and tribal-fusion belly dance just before moving to Bloomington in 2016. She is currently studying salsa and bachata, in addition to continuing her study of ATS® and Datura Style TM belly dance. She is also continuing her study of music at the IU Jacobs School of Music. 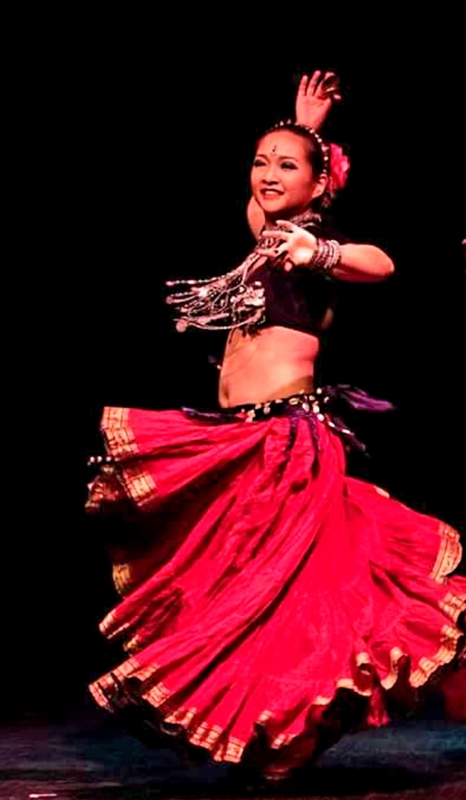 Rebecca began learning belly dancing in 2007 and experimented with several different styles in Taiwan. 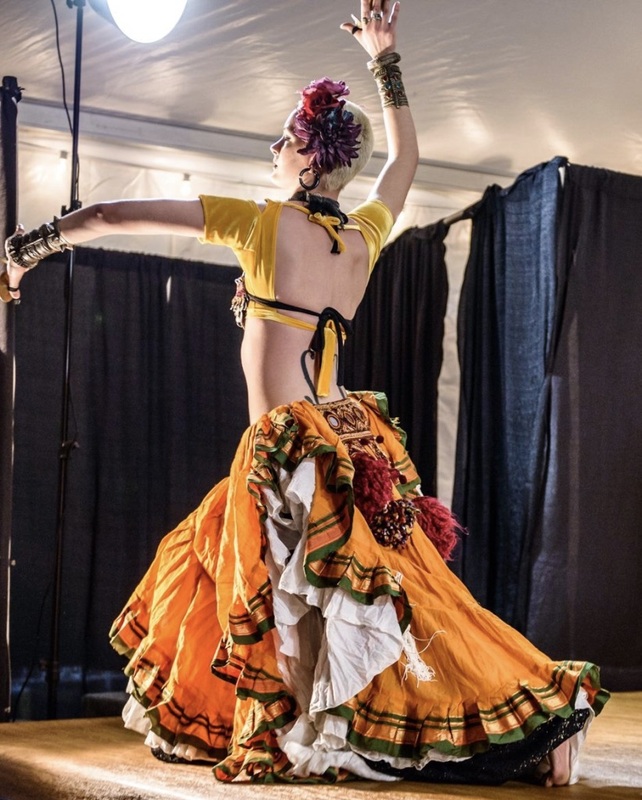 She has been studying American Tribal Style (ATS) since 2015 from Virgina Hojas after moving to Bloomington and was drawn to the beauty and strength of the ATS belly dance. ATS has become her favorite belly dance style due to the sisterhood dance relationships and the commmon knowledge of the dance vocabulary that allows ATS dancers from different regions to collaborate even if they have not previously danced with each other.